Some of our favourite articles that we’ve done are where we get to find out about the good that football is doing for society. Football might just be a game, but it has the power to bring people together and change lives. Corny as that might sound, it’s true. Man v Fat Football leagues here in the UK are living proof of it. These leagues represent a brand new concept in weight loss programmes. Significantly, they’re one of the few weight loss programmes aimed specifically at men, and the results of the first few leagues have shown that they’re staggeringly effective in helping people lose weight. What’s more, they’re appealing to lots of men who otherwise have very little support in their fight against fat. When you read quotes like that, you realise they’re really on to something. So we decided to take a closer look. It all sounds impressive. That’s why we wanted to bring you an exclusive interview with the founder, Andrew Shanahan. He’s a guy who himself used to be obese, but having gone through the struggle of getting down to a normal weight, knows all about the challenges involved, and has a real appreciation for the role that Man v Fat football can play in all of this. You can either listen to the audio file below for the full interview (it can be played straight from your device or download for listening offline) or read our interview summary below. Either way, hopefully you’re going to enjoy hearing about this remarkable scheme which is badly needed in the UK, to help tackle our current ‘obesity crisis’. How did Man v Fat Football come about? “I was a journalist for many years, writing about food and restaurant reviews, and that sort of thing. And as a result, I put on a lot of weight, to the point where I was just over 17 stone, which for someone who’s relatively short, isn’t a particularly good idea. So I was obese, and wanted to lose weight around the beginning of 2013. And as I lost weight, I just couldn’t find anywhere where there was any sort of support just for normal-ish men. It was a very odd situation because you would imagine, given the scale of the problem, that there would be loads of schemes and companies would’ve been making money out of it. I started Man v Fat in 2014, and that was based on my own experience of losing weight and it’s not finding any support. That was just a website and a forum, which has obviously grown, and grown. 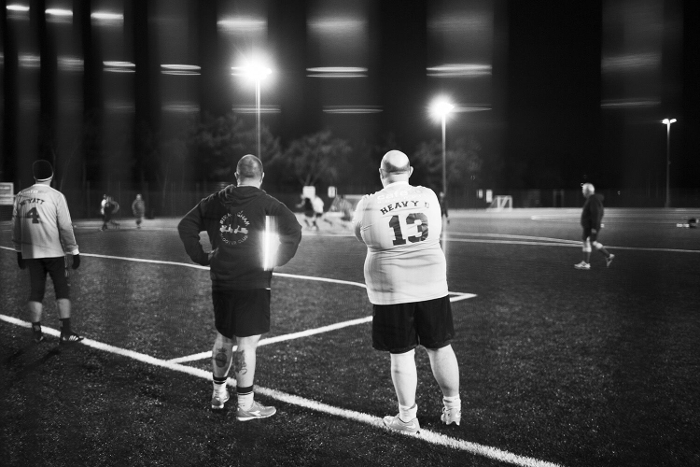 The upshot shot of it all was that we launched the first Man v Fat league in January  in Solihull, where the local authority has contracted us to provide weight management for men. How did the initial trial of Man v Fat Football Leagues Go? “As far as I’m aware, though I stand to be corrected, I think it’s the most successful weight management program that has ever been done for men. Normally, a successful weight management program according to NICE (the organizers of these things) 30% of people on the scheme losing 5% of their body weight is deemed as a good result. We got 62% of our players who lost 5%, and some 95% of them lost weight as a whole. So it was working really well. We had applications from around the world. We had a Brazilian TV that company that came over and did a seven-minute section on their national news. It was in pretty much every national newspaper and we had a real response. We had loads of men from around the world saying “Yes, I need this. I want this. This is exactly what I’ve been looking for.” And that’s why we’re now in a position where we’re launching this nationally, at all the Powerleague locations. 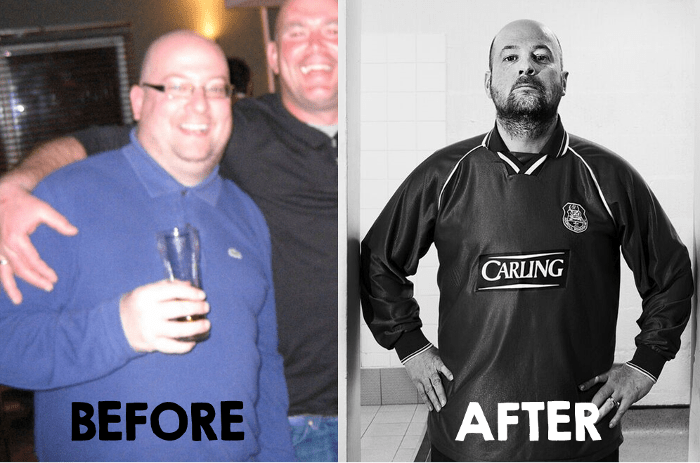 One example of a successful participant in the Man v Fat League – before and after. Why is there a need for Man v Fat Football, why can’t guys just join normal leagues? “That’s a really good question. For many men, having been in that position myself, barriers come up between you and football. So, one of the barriers is, “I don’t want to go and be the only fat bloke there.” You normally see it on every Sunday League team, there’s one fat bloke who’s perfectly comfortable being the fat bloke. But for many of us in that situation, they don’t feel comfortable. They feel embarrassed. They feel worried about their health, and how that would impact on them playing football. The other thing is that there’s — there’s that sort of sense that if I go and join a team of ostensibly lanky, skinny guys who are all at a normal BMI, It’s not really a competition, is it? It’s very difficult to stay motivated when you’re getting thrashed every week. People are going, “Oh, come on, track back,” and you know that it’s you letting the team down. So the obvious solution was to provide a league where it was all players who are overweight or obese. And that’s what Man v Fat football is. Also, when we were putting this together, we decided that we need to make weight loss on an equal footing or greater with the actual importance of the football in this league. So, the way that the football leagues there are produced, it’s not just the football that counts towards the results, it’s the weight loss as well. So it’s as much about the weight loss as it is the football? “We’ve got various, different ways that teams can earn points and goals – goal bonuses – through weight loss. And so, actually, the weighing in becomes just as much a part of the results and the league table as the football does. We’ve got a special scoring system where players are rewarded for hitting that 5% weight goal; the number of players on a team who lose weight are also a factor, and if you lose weight consistently, you can score a hat trick in weight loss. You can also score an own goal by going above your original weight. It makes talking about weight loss completely okay for men. So, what you have is that you have all of these guys who – genuinely, I can’t imagine any of them ever having discussed weight loss before – normal blokes, basically. They all say, “I thought weigh-ins would be done in secret and be all discrete, but everyone’s gathering around and cheering on the team when someone’s lost weight, and that sort of thing. So, it works really well in getting guys being able to talk about weight loss. Do you think there’s a stigma to saying that you play in a Man v Fat League? “I think the fact that we’re so open about it, it’s almost like reclaiming the word “fat,” it’s sort of saying, “Look, we’re all fat, but you’re not going to be the only fat bloke in the room.” And some of our players are 30 stone plus. All of them are on exactly the same mission, and trying to do exactly the same thing, which is lose weight. What if you don’t have enough fat friends to make up a team? “About 80% of the guys who join us join on their own, and we put them into teams, so we’re not expecting people to join with mates. If they want to do that, if they’ve got friends or family who are overweight and they want to join as well, then that’s fine. But most of the time, it’s just guys joining on their own and we put them with teams. We balance that out so there’s enough strikers, goalkeepers, and defenders, and midfielders in the team. And we also play roll-on, roll-off subs, so at the beginning, when everyone is struggling to play longer than 5 minutes, there’s a constant supply of players, with 10 in each team. What is the standard of football like? “It’s really, really good. And you can probably see some of it on the YouTube. A lot of these players were ex-semi-pros and that sort of thing, who just got injured, lost their way, put on a bit weight, had kids, got married, just life happens, you know? I think that this really reaches out to those people who love football. Look around the stands of a football stadium, 67% of men are overweight or obese. So, a huge number of those guys will also be massive football fans and be into it. What we’re trying to do is provide them with a platform where they can get back into football and sort out their weight at the same time. Besides the weekly football, what other support is available? “We make sure there’s dietitians and exercise professionals who can help them, there’s the [online] forum of thousands of other blokes that are looking to do the same thing. There’s the guy or girl who will weigh people in before they play. And they’ve often got the sort of background where they can give support and advice about things. We got the website which 300,000 guys a year are on. There’s also a free book that we give all the guys who join: the Man v Food Football Handbook, which takes them through everything they need to know about weight loss. Or they can even buy the book that I wrote called the Man v Food Manual*. “People can register as a player, which is either £10, or £15 if they want a copy of the book [the Man v Food Manual*] and then it’s 6 pounds a week for the football. 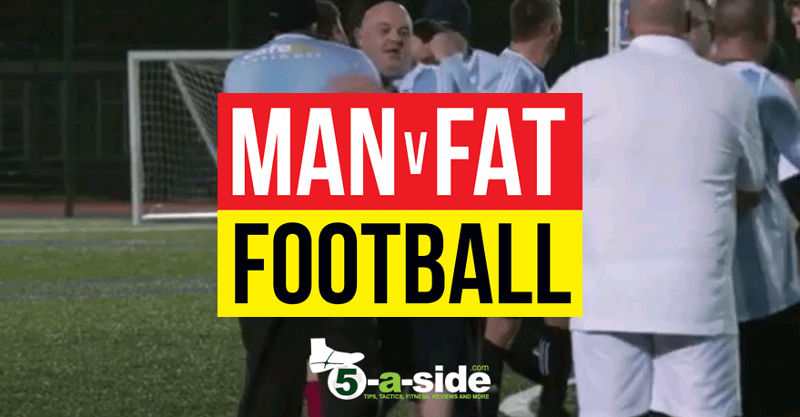 “If this scheme has got you fired up and ready to start making changes in your life – and let’s face it, what better way to do this than by playing football – then you can find out more information and register for these leagues by visiting manvfat.com/football. Note: 5-a-side.com has no affiliation to Man v Fat. We have not been paid for this article, nor do we benefit in any way through readers choosing to sign-up to the Man v Fat Football leagues. We are, however, very pleased that we could cover this scheme and the role that it can play in changing the lives of overweight UK men. Photographs have been used with the permission of Man v Fat.